“The Roman's Road” is popular method of presenting the Gospel using only Scriptures from the Biblical Book of Romans. It is certainly an effective soulwinning tool which every believer should be well familiarized with. 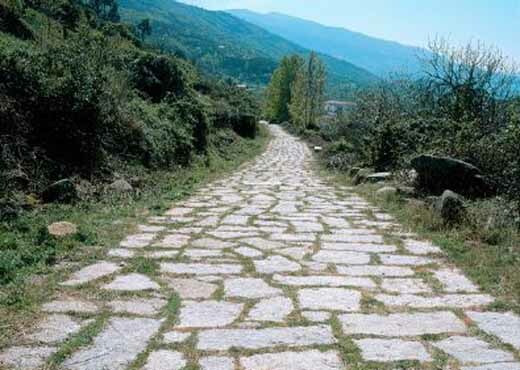 It is called the “The Roman's Road” because it uses Scriptures from the book of Romans, the sixth book in the New Testament. Before I say another word let me WARN YOU that the Roman's Road is a false plan of salvation if you leave out the Gospel, which according to 1st Corinthians 15:1-4 is the DEATH, BURIAL and RESURRECTION of Jesus Christ. I realized recently that many versions of the Roman's Road tract does not even mention the resurrection of Jesus Christ. I am not against using the “The Roman's Road,” but you need to understand that it is not the Gospel unless you include Christ's death on the cross, His burial and bodily resurrection three days later. This is “the Gospel” by which we are saved if we believe it. Certainly, a lost sinner can be led to the Lord through many other Books of the Bible, but the Book of Romans is rich in doctrine and a masterpiece of divine literature. Thank God for the wonderful Book of Romans! I was saved at the age of 13 in Chicago. I remember my first soulwinning experience while going door-to-door soulwinning with other members of our church youth group. An adult women answered the door and after a brief introduction, I asked her, “Do you know for sure if you died this moment that you would go to Heaven?” She replied, “No.” I asked her if I could share the Gospel with her and she agreed. I was stumped and didn't know what to say. I froze. So I read to her the Gospel tract in my hand, which was called “The Roman's Road.” I couldn't explain anything more to her other than what I was reading. I remember feeling frustrated and ill-prepared. I recall telling her that she could call my pastor if she had further questions and I pointed out the church's phone number on back of the Gospel tract. I went away sad because I had the opportunity to win someone to Christ but didn't understand it enough myself to explain it. I went home that afternoon and memorized The Roman's Road and was determined to be prepared the next time I went out soulwinning. Although I was saved at the early age of 13, I didn't receive the blessed assurance of my salvation until I was 20-years old. I lived in constant fear, and cried myself to sleep many nights, wondering if perhaps I didn't have enough faith or maybe I had missed something. I was so afraid of going to Hellfire. Looking back, I now realize that it was my woeful ignorance of the Scriptures and God's plan of salvation that caused me so much emotional fear, worrying and doubt. I was saved, but didn't understand it, and so my mind was filled with many doubts and fears. As a result of my painful ordeal, I wrote a book called, SALVATION, so I could share with others the wonderful truths which God gave to me to settle the assurance of my salvation. I have never doubted my salvation since. I now fully realize that I am saved, not by my own self-righteousness, but by HIS RIGHTEOUSNESS. Philippians 3:9, “And be found in him, not having mine own righteousness, which is of the law, but that which is through the faith of Christ, the righteousness which is of God by faith.” It's not a prayer that saves us, but our faith in the Lord Jesus Christ. Salvation is of the Lord. I was focusing on an experience, the words I spoke when I prayed, the degree of my faith, et cetera. I was really worried. Thankfully, those days are forever gone and I know beyond any shadow of a doubt that my name is written in Heaven in the Lamb's Book of Life. Also, may I kindly say, you are not saved by repenting, you are saved by placing your faith in the Lord Jesus Christ. Albeit, no one has ever believed who didn't repent. Repentance is simply a change of mind unto the Gospel itself. Repentance is simply admitting that you are a sinner in the eyes of a holy God, thus seeing your need for the dear Savior. The very moment that you place your trust (faith) in the Lord, receiving His sacrifice on the cross as payment for your sins, believing that He was buried and bodily raised up from the dead three days later, you are immediately and forever saved (i.e., born-again). Here is The Romans' Road . . .
All Have Sinned. Romans 3:10 states, “As it is written, There is none righteous, no, not one.” And again in Romans 3:23 we are told, “For all have sinned, and come short of the glory of God.” Romans 5:12 tells us, “Wherefore, as by one man [Adam] sin entered into the world, and death by sin; and so death passed upon all men, for that all have sinned.” When Adam sinned, he brought the curse of sin upon all mankind. This is why everyone is born with a nature to sin, it has been passed down since Adam. There is a Penalty for Sin. Romans 6:23 says, “For the wages of sin is death; but the gift of God is eternal life through Jesus Christ our Lord.” Death is the penalty for sin, Physical Death and a Second Death. Most people confuse spiritual death with the Second Death. We are born spiritually-dead. Adam and Eve died spiritually the moment they sinned, and all of their descendants since have been born spiritually-dead. This is why a person must be born-again spiritually. God's Holy Spirit is that spiritual life. The Bible also speaks of a Second Death, which means being cast into the Lake of Fire forever as punishment for our sins. Just as a person is paid wages for work performed on the job, so does God payback sinners in the Lake of Fire. Jesus Died, Was Buried, And Rose Three Days Later. Christ died for our sins! Romans 5:8, “But God commendeth his love toward us, in that, while we were yet sinners, Christ died for us.” What a precious Scripture! God in His love decided to give mankind a chance to escape the wrath of God's judgment. Jesus came and laid down His life for us, knowing just how sinful the human race is. God expressed His love for humanity, paying men's sin debt, knowing that we are so undeserving. Jesus DIED on the cross, was BURIED and bodily RESURRECTED. This is the “Gospel” according to 1st Corinthians 15:1-4. If you receive the Gospel as payment for your sins, then you are saved immediately, irrevocably and eternally. Salvation is the simplest thing in the world, but men can make it so complicated. Some people say that faith in Christ is insufficient to save a lost sinner. They claim that a person must depart from their sinful lifestyle and commit their life to live for God. That is a very complicated requirement for a person who's been living in sin their entire life. Old habits are not easily broken. The truth is that salvation is a free gift that God offers to humanity. Salvation is receiving, not giving. Notice once again the words of Romans 6:23, “For the wages of sin is death; but the gift of God is eternal life through Jesus Christ our Lord.” All God requires of us to receive the free gift of eternal life is that we come by way of faith in His only begotten Son, Jesus Christ. Amen!